S.O.P. – Save Our Planet! Readers of Share International will be glad to know that the much anticipated companion volume to A Master Speaks has just been published. A Master Speaks – Volume Two contains articles dictated by Benjamin Creme’s Master and published in Share International magazine from January 2004 to May 2016. Long in the making, it was planned with Benjamin Creme’s co-operation and approval. As a disciple of one of the Masters of Wisdom Who guide humanity’s evolution, Benjamin Creme received these inspiring articles by mental telepathy. A highlight of the magazine the articles were published almost monthly from the time Share International was launched with Benjamin Creme as founding editor in 1982. They cover a very wide range of topics including, among many others, ‘The brotherhood of man’, ‘The ending of war’, ‘Unity in diversity’, ‘Saving the planet’, and ‘The cities of tomorrow’. The book also contains a number of short Messages from Maitreya that Benjamin Creme received occasionally at the end of media interviews, lectures or gatherings. A Master Speaks – Volume Two is published in Benjamin Creme’s memory and can be seen as a valedictory volume, marking the ending of his lifetime’s work with his Master. The legacy of this work lives on in this new volume, a testimony to their close relationship. Benjamin Creme, A Master Speaks – Volume Two. 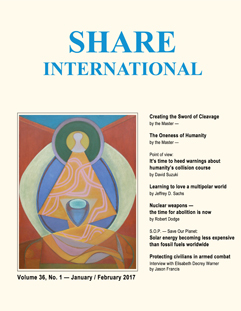 Articles from Share International Magazine. ISBN 978-94-91732-11-9, 256 pages, Publication date: April 2017. Since the inception of Share International magazine, Benjamin Creme’s Master has provided articles to be published not only at the time they were written, but also whenever appropriate according to world circumstances. Indeed, many of these articles seem more relevant now than when they were first published. In the following article the Master presents a number of hope-inspiring ideas: that humanity is “ripe for change” although unsure of the direction the new way should take; He exhorts us to realize our divine nature. Maitreya is here now to advise and guide humanity to create “a civilization worthy of men who are moving into their Divinity”. Throughout the world, men are beginning to realize that their long-held beliefs and certainties are less certain than they had supposed. The breakdown of their social and political institutions calls in question the value of their established ways of thinking, and presents men with a dilemma: the current modes of thought and action no longer seem to work; the future modes are, as yet, unclear. Thus it is that men stand undecided, awaiting guidance, lost in a vain attempt to maintain the past or to predict the future. In such situations, men are ripe for change. Few there are who know the direction or the extent of the needed changes, nor how they may be accomplished, but, gradually, it is dawning on many that the present ways of living are bankrupt of meaning and lack all potential for human happiness. Large numbers thus ‘opt out’ of the struggle and seek solace and equilibrium in the growing number of religions, philosophies and ‘cults’, ancient and new. The changes needed seem too vast, too radical for human hands or minds to set in motion, and they turn inwards to the God Who, they suspect, controls the affairs of men. Did they but know it, they, themselves, are that very God, awaiting an opportunity to manifest. They, themselves, control their lives, for good or ill. It is they, by their actions, who turn the wheel of events, who engender conflict or peace, who sow mischief or goodwill. Men must learn their role and innate power in life and take, thus, responsibility for its quality and direction. Unless they do this they will never leave their infancy behind. Maitreya enters now the world arena to teach men that they are Gods in potential, that they are powerful indeed, and that conditioning alone, holds them in thrall to superstition and fear, competition and greed. He will show men the way to renounce the past, and to construct, under His wise guidance, a civilization worthy of men who are moving into their Divinity. The day is not far off when men will hear His Call, and hearing, respond. The day is not far off when men will know that the long dark night is over, that the time has come to welcome the new light which has entered the world. Thus will men begin the task of reconstruction, a task which demands the strength and will of all. All must see this time as an opportunity to serve and grow, to fulfil the destiny which has brought them into the world now. Benjamin Creme did not set himself up as arbiter of the authenticity of other groups’ activities and communications. Share International will continue to follow the same policy. Q What happens after death? Where does the soul go? A. It depends on the individual. At death you relinquish the physical body, then you spend a longer or shorter time in the astral or emotional body. And depending on the evolution of the person they will then spend time in the mental body – having given up the physical and emotional vehicles. The soul is always there – it does not go anywhere. There is nowhere to go to! It’s not as if there is a distance between this life and the afterlife. It’s a question of consciousness rather than distance. It is the soul which reincarnates again and again. This body, the physical body, together with the astral and mental bodies is only an apparatus for the soul to demonstrate at this level. The personality, too, is just a vehicle for the soul. Q. Do we come back into incarnation with the same personality and the same soul? A. When the soul is ready to incarnate again it creates a new body in the womb of the mother and that gradually becomes infused with the astral and mental nature and the soul begins another life – in a new body, sometimes as a man, sometimes as a woman. And the person has a new, different personality. The personality is a reflection of the soul. The soul in its turn is a reflection of the spirit of God, the divinity. It is changeless, divine. The divine manifests as the soul which is the connection in time and space between divinity and the man or woman in incarnation on the physical plane. It is the divine intermediary. Q. I have read that the Masters have experienced everything on our planet – is this correct? A. We are divine. We are gods. This is not just a literary or poetic sort of thing to say, it is reality! We do not behave like gods. That is the problem in the world: that the gods say we are gods but the humans don’t behave like gods! The Masters are men who know they are Gods and demonstrate Their divinity. That’s the difference between us. The Masters – Maitreya and all the other Masters, have conquered death, they have manifested Their divinity. They have done this through life, trial and error, making mistakes – every experience, every humiliation and disgrace, every effort to recover and demonstrate again and again, that divinity, They have gone through all of that – the fact that they have done it, all of it, is a guarantee for all of us. Q. How much time passes before one reincarnates again? Some of the Masters, in particular Maitreya and the Master Jesus, appeared at Benjamin Creme’s lectures and Transmission Meditations. They also appear in different guises. If the experiences were authenticated by Benjamin Creme’s Master, the letters are published. These experiences are given to inspire, guide or teach, often to heal and uplift. They also draw attention in an amusing way to some fixed intolerance to, for example, smoking or drinking. At times the Masters act as saving ‘angels’ in accidents, during wartime, earthquakes and other disasters. They use a ‘familiar’, a thoughtform, who seems totally real, and through whom the Master’s thoughts can be expressed. They can appear as a man, a woman, a child, at will. Occasionally They use the ‘blueprint’ of a real person, but in most cases the ‘familiar’ is an entirely new creation. Letters received since November 2016 (and therefore not confirmed by Benjamin Creme’s Master) are included because the experience ‘speaks for itself’ and often provides hope, inspiration and comfort. On an unseasonably warm October day in 2001 I decided to take a walk along the nature trail in a state park less than a mile from my home in Massachusetts. I was quite startled when I came upon, rather abruptly, an elderly gentleman walking in the opposite direction. I laughingly told him that he had scared me. He commented that the park was noisy that day, referring to the dry leaves we were rustling. This really mundane encounter left me curious, nonetheless. Was this elderly gentleman Maitreya? I would like to ask you about something that happened when I was about 7 years old (1975). I went to the beach (Ajigaura, Ibaraki-ken) with my mother and little brother. I walked in the sea with a swimming ring. But I went too far. I couldn’t turn back. I looked around, but there was nobody. I called for help, but nobody heard it. Death became reality to me all at once. I was struck by the extent of sea. And I accepted the fact that I would die. I looked back – a man was there. He looked about in his 30s and an ordinary man (Japanese). He helped me. He said: “Don’t go too far.” I couldn’t speak. I nodded only. He went off to the sea. Suddenly, I couldn’t see him. But then I realized I would live. I can’t forget him. Who was he? Was he a kindly ordinary man? On 26 January, after we had finished packing and posting the first issue of Share International magazine for 2017 we saw a familiar figure outside the Information Centre in Amsterdam. He has visited us several times before and was confirmed by Benjamin Creme’s Master to be a spokesperson for the Master Jesus. As usual, he appeared on his bicycle, had his cap backwards and stopped to help himself to free literature just outside the Centre. As always, he looked in through the shop-window at us, waved, grinned his toothy big smile, gave a thumbs up sign, waved again and went off on his bike. We had recently wondered briefly whether we might have a visit from a spokesperson. Group members, Amsterdam, the Netherlands. On 20 July 2001, I had an experience which is vividly in my mind. I was on the subway in Brooklyn. I am not familiar with underground trains, but it was more difficult than I expected, because the destination letters on trains just recently changed. For what seemed a long time I was directed in one direction, then another; finally I felt lost. It was a feeling of being helpless, which is unusual for me, being a seasoned New Yorker. But there it was: Despair. A man in a turban approached me. His face, his eyes, such goodness. He seemed to see through me. Pure love was present. He touched my wrist in a gesture of comfort. I was filled with peace. “Am I in the presence of a saint?” I thought. He calmly gave me directions to go up a flight of stairs. At the top of the stairs a friendly man took me to a platform. There I asked an African American lady if I was on the right track. She said I was, but on the wrong side. She let her train go and escorted me to mine. She said she would ride with me to make sure all is well. She did. The train came to an intersection. She took me to another train. She entered with me. She immediately spotted a young African American man and told him to make sure I get off at the right stop. He happily accepted. His face was kind, luminous like hers. He told me to get off when my stop came. I found the shop I had to go to in Brooklyn easily. The thought crossed my mind – how on earth will I find my way back to Manhattan – but as I entered the subway there was a kind African American man. He told me his name and said he’ll be with me until my stop. He was. Such feeling of love was in the air. We hugged, I got off. I was on Cloud Nine. Was the man in the turban Maitreya? Did he send his angels to pave my way? H.L., New York, New York, USA. It happened on 16 December 2001 in the morning hours exactly the day we were giving a benefit concert for the Foundation I work for and to whom my heart belongs. My thoughts, the evening before, were concerned with very intense prayers towards God and the Masters. I was praying for success, hoping that our chorus would perhaps sing better than at the final rehearsal. That morning I dreamt for the first time about Maitreya. This dream was so intense as He looked at me. I told Him how happy I was that He appeared to me. Later on that day and during the concert His face was present the whole time. His face seemed to be suspended in mid-air. While we were singing the Great Invocation, Holy Energy seemed to be materialized inside the whole room. Could you please comment if it really was Maitreya, who sent us this blessing? After a problem-free pregnancy the due date had arrived. For various reasons, I was alone for the whole of the labour (at home) which started in the late afternoon. Although the labour was intense but pain-free, I saw and experienced the Master (Benjamin Creme’s Master) look in to check on progress twice, possibly three times, during the night and early morning. I saw Him as if He had pulled aside a curtain and peered in at us – my unborn daughter and me. Each visit lasted only a few seconds. I was joined by my husband and the midwife the next morning an hour before the actual birth, which was uncomplicated. Some months later, I asked Benjamin Creme if this experience was real and accurate; he confirmed this to be the case. His Master had indeed looked in on us and had seen that both of us (mother and child) were fine and that the child “knew her way in – into incarnation”. The ‘Signs of the time’ presented in this section have either been confirmed in the past by Benjamin Creme’s Master, resemble similar ‘signs’ also confirmed or speak for themselves. Many phenomena have been witnessed by people who see them as confirmation of their hopes and faith. We present them for your consideration. Crowds have flocked to see a statue of the Madonna with tears in its eyes in the little church of Santa Librada in Villarrica, Paraguay, according to reports on 21 April 2017. Light patterns photographed on 26 March 2017 in Utrecht, the Netherlands, by S.B and R.B. Benjamin Creme’s reply to the following question (SI, July/August 2012) explains the value of the compilations presented here each month. Q. Some readers love the compilations while I have heard other comments to the effect that often the compilations simply repeat already used material. As the Editor, what is your opinion, please? A. They do repeat already printed material but these compilations remind people of the teaching. The thematic context gives them a different perspective and focus. My Master says that this is one of the most important parts of the magazine and that the compilations have a cumulative impact. Our aim in choosing this theme is to highlight the need for us, humanity, to claim our birthright, know ourselves as divine beings and so choose a future with the systems and structures that will best reflect our divine natures, as described by Maitreya, the Masters and Benjamin Creme. This compilation combines the ideas of both our individual and our collective destiny: the inner world manifesting in everyday life; the subjective made objective. In this way, we present here a vision of humanity’s challenge today: the creation of an outer world reflecting the divine reality, in line with the Plan and Hierarchy’s work. The quotations are taken from Maitreya (Messages from Maitreya the Christ and Maitreya’s Teachings – The Laws of Life), Benjamin Creme’s Master (A Master Speaks and Share International), and Benjamin Creme’s writings. On 5 June World Environment Day (WED) will highlight the 2017 theme: ‘Connecting People to Nature’. WED calls for positive environmental action to foster harmony between humanity and nature. After decades of discrimination and neglect, indigenous people are gaining recognition as custodians of the land, with rights to ancestral lands and the resources they contain. Conservationists increasingly recognize that ‘wilderness’ landscapes have been traditionally managed and protected by local and indigenous communities with unique knowledge on how to tackle environmental challenges. This resonates with current approaches to nature conservation, sustainable use of natural resources and adapting to the effects of climate change. Indigenous communities around the world continue to oppose illegal encroachments and destructive exploitation, such as mega-dams across their rivers or logging and mining in their forests. In 2015, 185 people many from indigenous communities were killed defending their land, forests and rivers against destructive industries, according to the campaigning group Global Witness. Our home, Earth, has been given a deadline –10 years. If humans fail to cut greenhouse gas emissions and fail to maintain carbon-absorbing systems like forests, then the results will be catastrophic, according to the International Institute for Applied Systems Analysis (IIASA). In a welcome breakthrough, researchers have developed a model that they believe could be a solution. The study, published in the journal Nature Communications, outlines a plan that could simultaneously account for carbon uptake by plants and carbon release by human-induced activities. “The study shows that the combined energy and land-use system should deliver zero net anthropogenic emissions well before 2040 in order to assure the attainability of a 1.5°C target by 2100,” said Michael Obersteiner, co-author and IIASA director. This target is in line with the Paris Agreement on climate change, which 194 countries signed, promising to limit future global average temperature increases to below 2ºC, in the hope that efforts would limit the average increase to 1.5°C above pre-industrial levels. But the COP21 agreement allows countries to accomplish this in whatever way they see necessary and failed to specify methods needed to achieve the goal. The IIASA model calls for fossil fuel consumption to be reduced to less than 25 per cent of the global energy supply by 2100, a drastic cut from the 95 per cent being used right now. Deforestation would also need to be cut significantly to lead to a 42 per cent decrease in cumulative emissions. The study shows that in a “high-renewable” scenario, renewable energy like wind, solar and bioenergy would need to increase by around 5 per cent a year for net emissions to peak by 2022. However, there also needs to be negative emissions technologies like reforestation and revitalizing ocean ecosystems or the global average temperature will still reach 2.5 degrees, missing the Paris agreement target. China has bumped up their renewable energy consumption, and entire countries like Denmark have committed to 100 per cent renewables. In the US, despite the Trump administration’s efforts to rollback climate regulations and even withdraw from the agreement, some states like California and Kansas have not stopped their drive to develop renewable energy options. The United Kingdom’s grid operator announced that 21 April 2017 was the country’s first coal-free day since the Industrial Revolution. “Great Britain has never had a continuous 24-hour period without coal. The National Grid confirmed 21 April was “the first time the UK has been without electricity from coal since the world’s first centralized coal-fired generator opened at Holborn Viaduct in London in 1882". Hundreds of thousands of scientists and their supporters gathered in demonstrations across the globe on 22 April 2017. In this unprecedented action, marches and rallies were organized in over 600 cities, largely in response to President’s Trump’s dismissal of climate science and proposed major cuts to US government agencies. These include the Environmental Protection Agency, NASA, the Department of Energy’s Office of Science, the National Oceanic and Atmospheric Administration and the National Institutes of Health. The March for Science was “…unprecedented in terms of the scale and breadth of the scientific community that’s involved,” Robert Proctor, a professor of the history of science at Stanford University, told The Washington Post. According to the marchforscience.org website: “We marched because science is critical to our health, economies, food security, and safety. We marched to defend the role of science in policy and society. We are science advocates and scientists who share an important goal: to champion science for the public good. The following week, on 29 April 2017, hundreds of thousands of people worldwide took to the streets for the People’s Climate March. More than 200,000 people protested in Washington, DC, with tens of thousands more joining via sister marches across the globe, including Japan, the Philippines, New Zealand, Uganda, Kenya, Germany, Greece, United Kingdom, Brazil, Mexico and Costa Rica. In the US more than 370 marches in nearly all 50 states took place, from small towns in Alaska to the streets of major US cities, including Miami, Denver, Los Angeles and Chicago. In Washington, DC, the march was divided into contingents such as ‘Protectors of Justice’, ‘Reshapers of Power’, ‘Many Struggles, One Home’ and ‘Fossil Fuel Resistance’, which included the growing resistance to President Trump’s and the Republican Party’s dismantling of climate and environmental policies. The bloc included activists and organizations fighting oil and gas drilling, coal mining, pipelines and power plants. “To aid men in their task, the Christ has formulated certain priorities. They cover the essential needs of every man, woman and child. The first priority is an adequate supply of the right food. Secondly, adequate housing and shelter for all. Thirdly, health-care and education as a universal right.” – Benjamin Creme’s Master, January 1989. David Miliband’s Polish Jewish parents were refugees themselves. His father Ralph was forced to flee from Belgium in World War II. “If Britain had not admitted refugees in the 1940s I certainly wouldn’t be here today,” he said. “Those are long-term, generational challenges,” said Miliband. “This refugee crisis is a trend, not a blip.” The causes of the crisis are weak states that cannot support their own people and divided international political systems. (1) Refugees need to be able to work. Support for work needs to be the norm. (3) Refugees need money. Most refugees are in cities, not camps, and cash assistance empowers refugees and boosts the local economy. More than 100 tech companies attended the talk – including Apple, Google, Facebook, Microsoft and Uber. All had signed a brief in court cases challenging President Trump’s proposed travel ban in January 2017. The room erupted in applause when Miliband suggested that in addition to hiring refugees, challenging untruths and donating money, listeners could personally extend a hand by voting “for politicians who will put into practice solutions I talked about”. “It’s a test of our humanity. It’s a test of us in the Western world, of who we are and what we stand for. It’s a test of our character. It’s revealing of our values. Empathy and altruism are two of the foundations of civilization. Turn that into action, and we live out a basic moral credo. Fail to help, and we show we have no moral compass at all…. Poverty blights the lives of billions of people throughout the world: in developing countries, where it is acute, and industrialized nations, where it’s hidden but growing. It arises from social injustice, makes exploitation and abuse inevitable, causes death and disease; robs people of opportunity and dignity. As more jobs become obsolete due to new technology and the closure of traditional industries, unemployment is set to rise, incomes disappear, and, unless there is a radical reappraisal of the economic environment, poverty levels will rise, perhaps exponentially. The World Bank claims that in 2013 almost 767 million people (11 per cent of the global population) were living in extreme poverty – income of $1.90 a day; however the UK’s Overseas Development Institute (ODI) found that more than 2.5 billion people are somehow surviving “on less than $2 per day”. Raise the bar to amore realistic $5 a day (two cups of coffee in a developed country), and over four billion people slide into the net. Poverty is the single greatest cause of death and condemns people to live hopeless lives of relentless hardship. At the same time those born into wealthy families are blessed with opportunities, security and comfort – gifts that should be the inheritance of every child no matter where, or to whom they are born. The coming age of the machine is part of a new time, and offers unprecedented possibilities to re-design the way we live. Technological innovation will, we are told, destroy more jobs than it creates. This will liberate human beings from lives of drudgery, allowing time to explore life, be creative and collectively redefine what civilization can be. But, as Yanis Varoufakis, Professor of Economic Theory at the University of Athens, makes clear, in order for everyone to benefit from these opportunities, “every citizen must be granted property rights over part of the wealth that the machines produce”. This requires a new approach to how we think about the economy and the way it operates. The present model – while it can boast of successes – is ill-equipped to respond to the challenges and opportunities of the time, and must go. Materialistic values are built into the system: selfishness, desire and excess promoted, and (speaking generally throughout) while philanthropy is part of some corporate strategies, presented with the choice of saving lives but losing money, administrators side with the money. Fundamental change has been needed for some time. The advance of automation adds one more imperative to the process. A new, sustainable, humane economic model is required, worthy of the 21st Century and beyond. The revolution in work requires an evolution in living: a new approach, in which the acknowledgment that humanity is One is primary. We are brothers and sisters of One humanity; the systems that govern our lives should be based on and encourage the realization ofthis fact. Sharing as a principle that animates human affairs naturally follows such an understanding and when pragmatically applied will allow everyone tolive dignified lives free from fear of poverty. Everyone is entitled to the means required to meet their needs, irrespective of whether they have a job and income or are unable to secure either…. Graham Peebles is a British freelance writer. He has run education projects in India, Ethiopia and Sri Lanka and is director of The Create Trust.